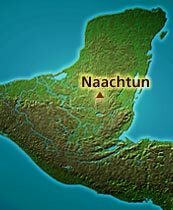 Also spelled Naachtún. Maya-region site listed in The Corpus of Maya Hieroglyphic Inscriptions "Sources of Sculpture and their Codes" and designated NCT (Graham and Mathews 1999). The ruins of Naachtun were visited in 1999 by Nikolai Grube, who reported a damaged emblem glyph ma-x-AJAW, suggesting that this was the ancient polity of Maasal (which appears in texts as ma-su-la) (Nikolai Grube, personal communication 1999, cited in Martin 2003). Subsequent to that time, however, Grube (2004:35) has listed the Maasul emblem glyph with the "names of unidentified Maya lands and cities". See "Naachtun: A Lost City of the Maya" by Kathryn Reese-Taylor, Peter Mathews, Marc Zender and Ernesto Arredondo Leiva (online). Also this press release on plans to explore the site. For the Naachtun Stela 24's description of the local lord as uyajawte' Siyaj K'ahk' on 8.17.1.4.12 11 Eb 15 Mac, see El reino del Murcielago (Powerpoint screens).